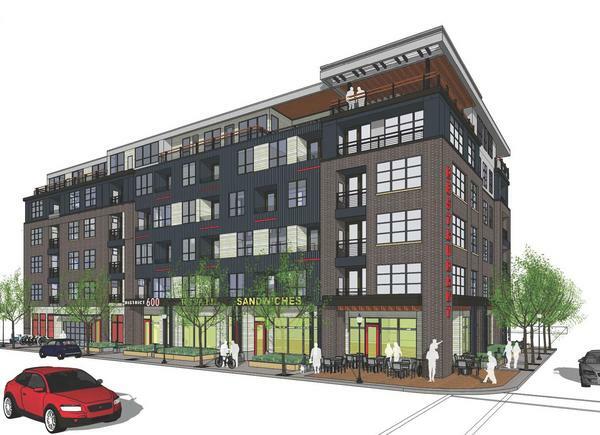 A team of developers Monday broke ground on a new 78-unit apartment project next to Fulton Brewing Co. The $12 million project, called District 600, is at 600 Fifth St. N.
It was called The Mendoza back in April 2012, and then re-named The Natural in January this year. It has been re-named again to “District 600” referring to its street address at 600 Fifth St. N., in the Warehouse District of Minneapolis. The project’s marketing materials plays up its proximity to Target Field, with a baseball theme. The development team includes Michael Development, led by Michael Swenson, St. Croix Real Estate, led by Terry McNellis, and Randy Hobbs, of Residential Renewal Inc.
St. Paul-based Collage Architects, Apple Valley-based Stonebridge Construction and St. Paul-based Bremer Bank are also involved in the project. Hennepin County awarded $565,000 for the project through its Transit Oriented Development (TOD) program. The Minnesota Department of Employment and Economic Development contributed about $150,000 to help clean up the site that was previously used as a junkyard, gas station and auto repair shop. The new building will feature a first floor restaurant, five stories of apartments and two levels of underground parking. Amenities include a fitness center, rooftop deck with grills, outdoor patio and a bike repair station. The building is an L-shape wrapping around the Fulton brewery. It’s across the street from Junction Flats, a 182-unit apartment project that began construction this month. District 600 is expected to open in June 2014. Florida Apartment Developer to Build in West End Ethanol Industry to Consolidate?